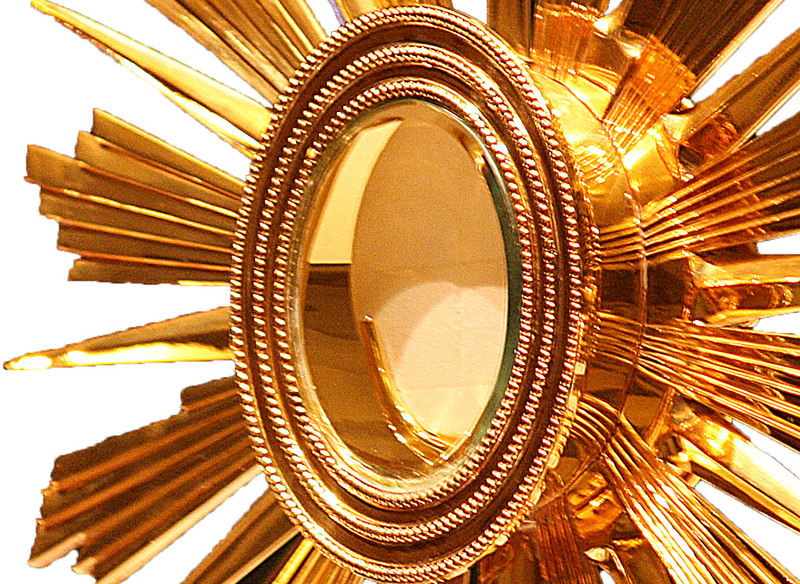 Benediction, from the Latin for “blessing”, is a service of exposition and adoration of the Blessed Sacrament, concluding with a blessing with the Sacrament. It is peculiar to the Western Catholic tradition. Benediction seems to have originated at the same time as the practice of elevating the consecrated elements for adoration during Mass and the celebration of the Feast of Corpus Christi and the reservation of the Sacrament in public view. These practices reflect the shift from a symbolic to a realistic understanding of the Eucharist, which began with the Eucharistic controversies of the ninth century. Benediction may well have grown out of the older practice of blessing people at the end of a rite with a relic or the cross or, in the case of Communion of the Sick, with the Eucharist itself. In the fourteenth century this practice was extended to blessing with the Sacrament, exposed in a pyx or monstrance those gathered at the place of reservation to sing an anthem after Compline. A pause for the adoration of the Blessed Sacrament, introduced into the newly established Feast of Corpus Christi processions, concluded with the priest blessing the people with the Sacrament. Following the Council of Trent (1545-1563) and its reaffirmation of the Real Presence in the Blessed Sacrament, churches tended to be built whose interior lines focused the eye upon the tabernacle, placed directly on the altar, and upon the throne provided at the heart of the reredos for the monstrance. With these developments Benediction became part of Catholic life until the Second Vatican Council (1962-1965) since when its practice has dropped off considerably..